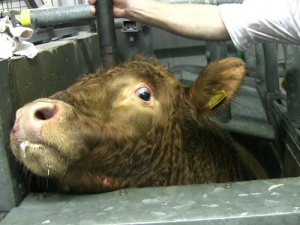 UK: From 4/5/18; ALL Slaughterhouses Have 6 Months Maximum To Introduce Compulsory CCTV Cameras. There can be no ‘good news’ when it involves facilities that kill animals; but after many years of campaigning, UK residents are now going to see CCTV installed in all UK slaughterhouses as a requirement of law. The legislation came into force on 4/5/18, and premises that do not already have CCTV now installed will have until November to comply. We at SAV are sure that this new legislation will prevent currently unseen abuses of animals during their final minutes of life at the slaughterhouse. We also welcome the fact that if veterinarians using the CCTV footage find welfare breaches, a slaughterhouse can be given a welfare enforcement notice, have its staff’s licences suspended or revoked, or be referred for a criminal investigation. Legislation requiring mandatory CCTV in all slaughterhouses in England comes into force today (4/5/18). Premises will have until 5 November to fully comply. We hope the presence of CCTV will help stop the horrendous and illegal additional abuses revealed time and again by our extensive investigations. It is terrible enough that animals should be at the slaughterhouse at all, without being subjected to being kicked, punched, beaten and burnt with cigarettes to name but a few awful issues we uncovered. Further information is available on the government website. We welcome this positive news on a long-fought campaign. But we will continue to encourage people to go vegan, since this is the best way to protect farmed animals. If you aren’t already vegan please sign up to our Summer Vegan Pledge today! A summary of responses published shows that of almost 4,000 respondents, more than 99% were supportive of the plans. Legislation to make CCTV cameras mandatory in slaughterhouses in England to safeguard animal welfare has been laid in Parliament by Environment Secretary Michael Gove. Under the proposals, Official Veterinarians [OVs] from the Food Standards Agency [FSA] will be given unfettered access to the last 90 days of footage. It is believed this will help them to ‘monitor and enforce animal welfare standards’. If OVs find welfare breaches, a slaughterhouse can be given a welfare enforcement notice, have its staff’s licences suspended or revoked, or be referred for a criminal investigation.